Biznar simultaneously searches across a collection of selected business sources including trade literature, blogs, newspapers, business magazines, and market research publications. Search results appear in a list that you can sort by rank, date, title, or author. You can also limit the results to specific sources using a drop down menu. Biznar automatically categorizes the results into “buckets” by topic, author, publication, publisher, and date. Each category is a hot link, so you can click on it to see the hits contained there. While no single source can meet all information needs, this one provides a good start for a wide range of business research questions. 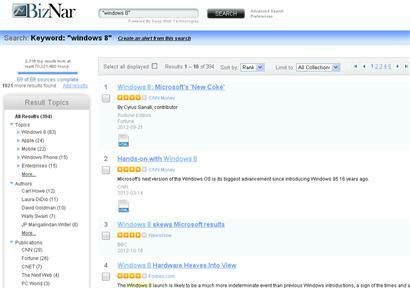 A search on “Windows 8”, placed in quotation marks to force the phrase search, illustrates the categorized results next to the ranked results. We all like to know what’s up with the competition. Having a handle on their plans, products, advertising claims, corporate strategy, or any number of other business programs can give your company an edge. Often business managers want to keep a low profile, minimizing the chance that the target company will notice that their competition is paying attention. A third party researcher can help facilitate this. Experienced business researchers provide a measure of anonymity while delivering valuable intelligence for informed decisions. For more information please contact Shamel Information Services.